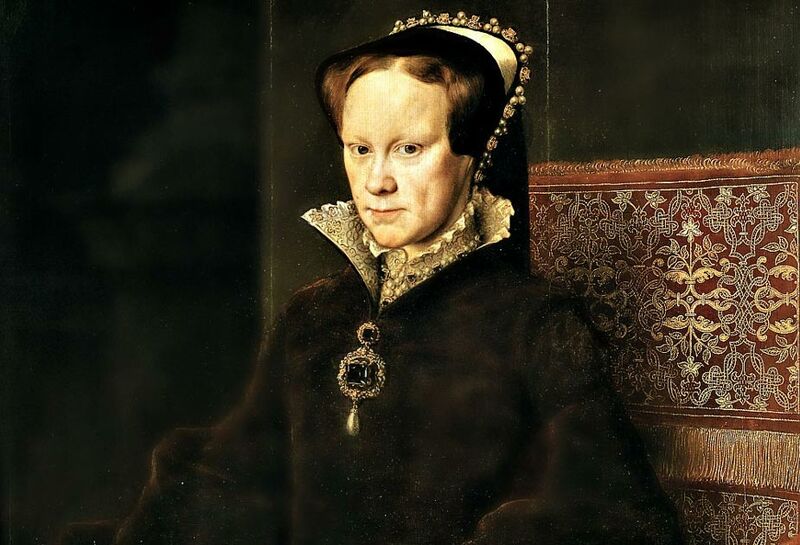 Mary Tudor was Queen of England and Irland. She is especially known for her attempt to implement The Catholic Church. She persecution Protestants, and for that she became known as the bloody mary. Mary was liked by my many people but also hated by her actions, but as a queen, she had a lot of power so people were weak against her. Her marriage with Philip II of Spain was very unpopular. He did not spend enough time with Mary when he realized she was not able to carry a child. She died at age 42 from uterine or ovarian cancer. The story is about a girl and a man who are on a vacation in Spain. In the story we read their dialog around the table in the train station. They are drinking beer and new drinks while they’re talking . We can assume that they are talking about her taking abortion. She is afraid but want to to it for the love. The man she is sitting with is a grown man who wants to drink beer and travel around the world, and she know that if she keep the baby he might leave her. The Kite Runner is a movie from 2007, directed by Marc Foster. The story in the movie is about destruction and was but at the same time friendship and family between Amir and Hassan. During a kite-flying tournament, something came up and changed their friendship. when amir became an adult he was hunted by the terrible incident from the past. The title can symbol the character childhood happiness and his betrayal to his childhood friend Hassan. It also might be a symbol of his native land,Afghanistan. Kites have been an important part of the Afganistan culture for a long time and are a symbol of prophecy and fate. The title might be a symbol of freedom as well. I think that the directors of the film choose this title because of the symbol it have. The Good Lie is a movie from 2014, is an American-Indian drama film. and is directed by Philippe Falardeau. The film is about the siblings Mamere, Paul Jeremaiah, Theo, Daniel and Abital. They escaped together during The Second Sudanese Civil War were they lost Abital. Theo got taken by soldiers in Sudan during the war when he sacrificed himself, the other children had to go on until they met a refugee camp in Kenya. Mamere travels after many years back to the refugee camp to find his brother, when he finds him they realise that Theo doesnt have a visa to travel to the USA. Mamere gives his visa to Theo and tell him to travel alone with it to USA. Theo was the first one to sacrifice himself and Mamere felt he had to the same back. the title of the movie “The Good Lie” cames out of this action. It is a good lie to give Theo a fake name to get a good and safe life. It is illegal to fake your own identity but in this context it was a good lie about his identity. The Good Lie and The Kite Runner put themes in perspective. They both deal with thees as refugees, family, friendship, racism and “The American Dream”. Both of the films symbolize redenption or guilt, but also friensship and family. The purpose of photojournalism is that it tells you so much more than a newscase for the same theme. When you see a photo of extreme poverty you will understand the importance of helping them instead of reading a report whit another person sight. Photojournalism is often used to document things and show the world how it really is. This photot shows us an old man sitting on his bed in a distroyed house. Maybe his house has been through a war or he had found a empty house. This gives us a strong massage from the war and the big poverty. The movie “Lion ” is based on the themes identity and belonging. Saroo who is the main character in the movie is an adopted boy who wants to get to know his real parents. When he moved to America to his adopted parents, he had to learn a new way of belonging and find a new identity that fits. He questioned his own identity when he got older, where he was from and what he had experienced when he was a little kid was the very interesting points. As the movie continued, we got to see that Saroo find more out about himself and his homeland. He did a lot of resources and the more he got to know, the more affected he got. We saw scenes of him that looked like post-traumatic stress or a kind of anxiety. This wanted him to find more out about his family and to travel home to his first home. After a while, Saroo finds out exactly where he lived before and planned to visit the place. He met the house he lived in with a lit of memories and just felt home again. one family who lived in the house came and talk to him and asked why he was there. he just said his mother’s name and that he lived there before. the man took Saroo by his hand and lead him to another place in the street. The movie showed us a beautiful old woman looking at Saroo with big eyes while he said her name. they all start to cry and celebrate that they were alive and got to meet again. I thought the movie was very touching. I, myself, am a person who cries very easy of touching movies, and this one is no exception. I kinda stressed through the whole movie because I wanted to help that little boy Saroo. The questions the movie raised for me was “why is the world so unfair”, “why have I got to live in a so good and safe home, and not him?”. I think it is so unfair and sad to think about, everybody deserves a life in a safe home and with their safe family. I think adoption is a very good alternative for many children in the world. children who live with families that don’t have food to feed the child or the safest home to live in, they have to get help from someone who can raise them safe. Adoption is not just an opportunity for poor children or those who live in places with war. Many children are adopted also in Norway to other families. children can live with bad parents who use violence or threatening, then adoption to a new and better family is a good opportunity. The disadvantages of adoption are like we see in this movie. Children will always be questioning where they belong and if their parents are still alive. These questions can be a bother for many, and the feeling of not living with your biologic parents can be hard to live with. I think the title “Lion” tries to tell us how Saroo felt about himself. He was like a lion, brave and hard but on the other side, he is a cat, soft and touchy. In Libya both men and women are being sold for slaves and when I read this I felt really terrible. I can’t understand why people are doing this to their people. It makes me angry to hear that people are treated like they was an object. I hope that someone will reach out to these people and change their sight on how to treat people as people. The world have to make a challenge. My class have read the book “The Reluctant Fundamentalist” and watched the film which is adapted from it. The story in the film and the book have some differences in plot, character descriptions and relationships that I am going to talk about now. The book focus a lot on Changez experiences , the people he meets and his thoughts around cultures, religions and 9/11. In the book we also get to meet Erica, a girl he knew from the past. Erica told Changez that her boyfriend died from cancer and that she had a tough time after her loss. The film makes a plot about Chris (Ericas boyfriend) , he was drunk driving, crashed and died. In the book, Changez told us a lot about Ericas depression and how tough her life was with a lot of ups and downs. In the end Erica was put away in a mental asylum and took her own life in the end. In the film we don’t get any insight in her life like we did in the book. I feel like Erica and Changez have a better and closer relationship in the book than in the film. Changez was more polite in the book because in the film we get to see fights and yelling and that he is mean to Erica. Later in the film we get to see why he was so upset. The meeting Changez have with a stranger in a cafe in the beginning of the book, in the movie has a name, Bobby. And as an occupation we know he works as a FBI agent. We only hear about “the American” from Changez point of view and from what he perceived. A new character that was added in the film was the professor Rainer. He got kidnapped in the movie and that’s why “the American” talked to Changez because he wondered where Rainer was and they tried to find out where he was. That plot is also added to the story of the film, and not the book. The end of the book and the movie is a lot different. They have first of all put more weight into the riot part of the story in the film in comparison with the book. Changez is a bigger part of the movement and a protestant, rather than a terrorist. The book focused more about fundamentalism, equal bad, religion and job, but the movie show us more about Americas part in Pakistan , and the prejudice was stronger. I think that the book was better because I liked the parts with Erica, and Changez and Ericas relationship. But at the same time I liked that the movie shown us so much about the conflict and the prejudices around cultures. But if I, myself, should make a film out of the book I would involve Erica a lot more. The book “The Reluctant Fundamentalist” introduce us from Changez point of view. we meet him in a café where he sits with an american, and Changez are talking about his story about his former life in America. The story untill now has been about his time in Princeton University, his meeting with Erica in Greece, and about his first meeting with Erica’s parents. My first impression on this book was that it was difficult to read and I had to think twice to get the point in the sentence. Now when I have read the book more I think it is more interesting and I want to continue reading it. The other characters we meet later in the book also made the story more interesting. I wonder how the book will end. A person who migrates to another country, usually for permanentresidence is an immigrant, and with this it comes many ups and downs. These two stories are showing us how it is to grow up in a culture were the rules and regulations are different from the place you are living in. child abuse is something really terrible but not everybody do something with it. people who are grown up in a family were they slap each other when something happens, they would not go so strictly on it. but someone, like we read in the text are taking it very seriously. The child in the story “free for all” report his father, not everybody would do that. Multiculturalism are something difficult for someone bus also so importan for everybody.